A Tomahawk owner might have dreamed this up in the 1960s. Steve Bruce provided more details about the 1956 Indian Tomahawk he restored to look the way an owner might have customized it in the 1960s. "I live in Southern Nevada near Las Vegas in a small town called Pahrump. 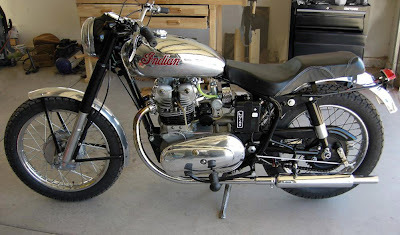 I have been motorcycling since 1969 and have always been a Brit bike enthusiast. I was an active member of the Southern California BSA owners club in the late 1970s and was also a member of the BSAOC club in England where I lived from 1981 to 1995. I got into Royal Enfields during the 1970s, when associated with another Southern Cal club member who had a collection of several 1960s Interceptors, as well as BSA's. "About 1977 I saw a restored Indian Enfield twin in a dealer showroom and always wanted to have one — but it took more than 30 years for me to finally get 'round to doing the restoration on this Tomahawk. 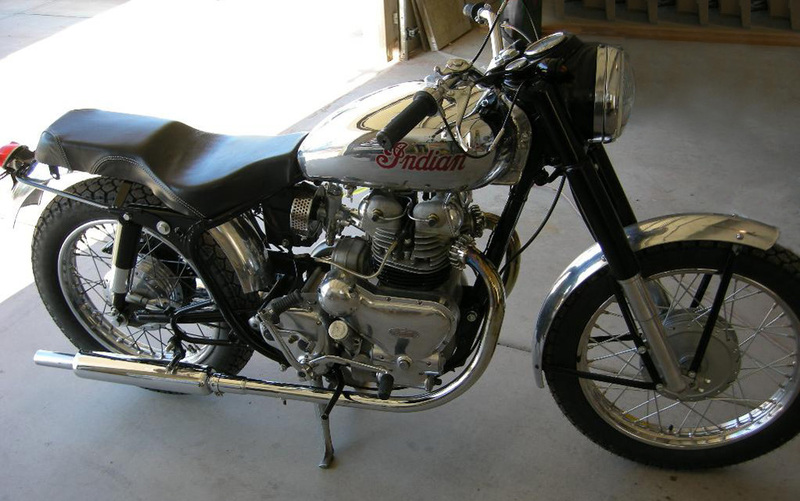 "It is a model year 1956 Tomahawk 500cc engine in a '58 Trailblazer frame. It has new set of 8.1:1 high compression pistons from FW Thornton and had some porting work done by a local speed shop, along with new valves /guides etc. I used stainless cylinder studs from Motalia which are essential when 5/16" studs are used. It has a new Amal 376/1716 carb, which is a huge improvement over the old 376/40. "The mudguards are from the Classic Bike Shop in the UK and closely match the original type, as does the pattern tail lamp bracket with Miller lamp. The Lucas battery is just a shell (obtained from Carrot Cycles) and houses a modern 12V battery that is charged by a current production alternator mounted on a Hitchcock's 12V alternator adapter (to convert from 6V). The original tool box is missing. "I had to rebuild the rear wheel and install new drive rubbers, but the sprocket and rear brake were in like-new condition. The exhaust is from Feked.com but I believe made by Armours in the UK. The velocity stack (pictured here) is just for show, I put an air cleaner on (as shown below) to ride the bike because this is a very dusty environment. The SR2 magneto works well but I am experimenting with electronic ignition using the India-made distributor and a Wassel EI module. Lucas battery shell hides the real battery. "My next project is to fit a siamese two-into-one exhaust and see how that affects performance. "I wish to thank local enthusiast David Parapilly for his assistance, and Mike of Tom Oil who provided me with a lot of help. "Overall it has been a very enjoyable project, thanks to the help and interest received from fellow enthusiasts!"